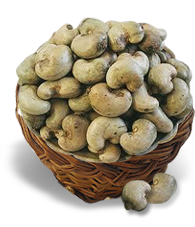 We, being a quality oriented organization, focused on offering a best range of Cashew nuts, Widely consumed as raw, our cashew nuts are also used for preparing various dishes like kheer, custard, fruit salad, desserts and namkeens. Our cashew nuts are appreciated in the market for its long kernel size, rich taste and high nutritional value. We offer these cashew nuts in hygienic packaging to protect these from moisture and to preserve their taste and crunchiness. Our wide range of Cashew Nuts include Cashew Kernel, Raw Cashew Nuts, Cashews, W180 Cashew Nut, W 210 Cashew Nut, W 240 Cashew Nut, W 320 Cashew Nut, Cashew Nut Split, Cashew Nut Lwp, Cashew Nut Swp, Raw Cashew In Shell.